I little bit of humor that seems to be spot on. BTW, I enclosed it a <figure>, an HTML5 element. 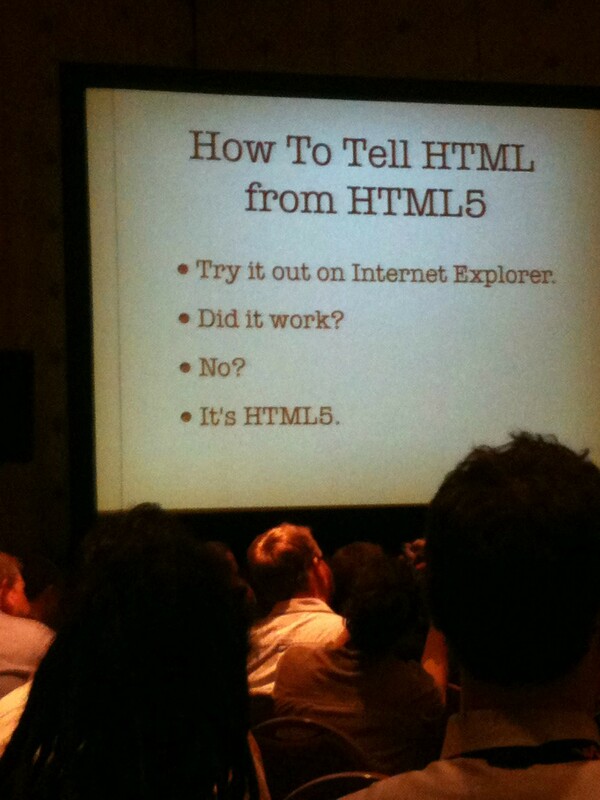 If you are reading this in Internet Explorer, you're not going to like this <figcaption> element either! So why doesn't this site appease Internet Explorer users? To be honest, if browsers were anthropomorphized as people, Internet Explorer would be the wimpy kid group who always has some excuse to convince the rest of the group not to participate in some fun activity. 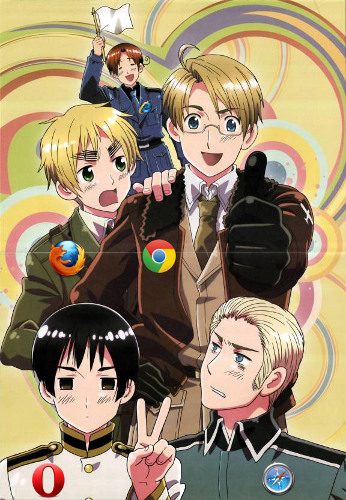 Of course, the best example I could come up with would be the boys from Hetalia: Axis Powers. Internet Explorer would be Italy Veneziano. The other characters in the following image (from left to right starting in the middle) Brittan as Mozilla Firefox, America as Google Chrome, Japan as Opera, and Germany as Apple Safari. With apologies to Hidekaz Himaruya for this edited image. Check out Hetalia: Axis Powers on Netflix. Of course, anime-style personification of software is nothing new to Internet culture. The previous decade had the OS-tan girls, a phenomenon that although started in Japan, took flight around the world especially given that Windows ME was a fickle and troublesome as the female character that personified the operating system. The most popular software personification at this time is the computer generated diva representing Yamaha's Vocaloid 2 music synthesizer software who goes by the name of Hatsune Miku. Creating a humanoid image to this software really help boost the popularity of this software and gained special recognition throughout the web. I have to admit, this song has been one of my favorite songs on Last.FM in the past year. Her popularity managed to earn her a commercial deal with Toyota in the United States last year. A concert featuring her as a hologram projection was also held. This technology is also how back here in America there is now a virtual Tupac Shakur singing "California Love". This post is starting to get really nerdy. So lets wrap this up so I can post another post this afternoon. I still have those programs to finish up this weekend.